Neonatal Intensive Care Unit (NICU), a level-three unit, located in C3 ward( NICU A ) at AIIMS caters to the needs of 2800 high-risk mothers who deliver per year. Another 12 bedded intermediate care area ( NICU B ), 8 bedded KMC ward and 30 rooming beds provide the inpatient services at New Pvt Ward area 1st Floor . Equipped with modern state-of-art equipment, our NICU is managed by team of highly skilled nurses, neonatologists, fellows, MD residents and other support staff. Our motto is to provide humanized, compassionate care with optimum use of technology to manage sickest and tiniest of neonate. The parents form an integral part of the team providing care to their infant. The unit has facilities of conventional and high frequency ventilation, i NO , brain function monitoring , total parenteral nutrition, invasive and noninvasive monitoring, intensive phototherapy. The back up services of pediatric surgery, radiology including latest neuroimaging ,pediatric cardiology, nephrology, lab medicine, hematology, blood bank, pathology, genetics and microbiology are available round the clock. We have a long experience of performing neonatal autopsy. We have multidisciplinary follow-up services for high-risk babies being discharged from our unit. 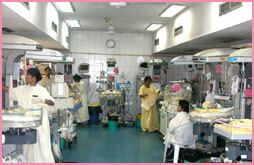 Established way back in 1962, neonatal care has moved in leaps and bounds at AIIMS. A simple set of interventions in form of abandoning stock solution, using IV cannula in place of scalp vein set and use of plenty of disposables led to drastic reduction in neonatal mortality rate (NMR) (36.6 in 1985 to 23.9 in 1986). Later with institution of neonatal ventilation services, NMR further fell down to 15 per thousand live birth. Our current NMR is 16 per thousand live births , despite more ELBW/VLBW babies . Our unit has been accredited as WHO Collaborating centre in 1997. We provide training to in-service doctors from India as well as from other countries. Presently a number of clinical research studies are in progress.